Jingle Your Bells to CityVille Holidaytown and Save Christmas! Being Santa’s little helper just took on a new meaning – imagine the power to actually save Christmas! Welcome to CityVille Holidaytown, a new game in the App Store for iPad, iPhone and iPod touch from the creators of CityVille Hometown that gives you the power to help save Christmas by building homes and workshops for the North Pole elves to get them back on track in time for the giving season. Decorate your town with gingerbread houses, Christmas trees, sleds, snow globes, toy shops, and packages wrapped with bows. 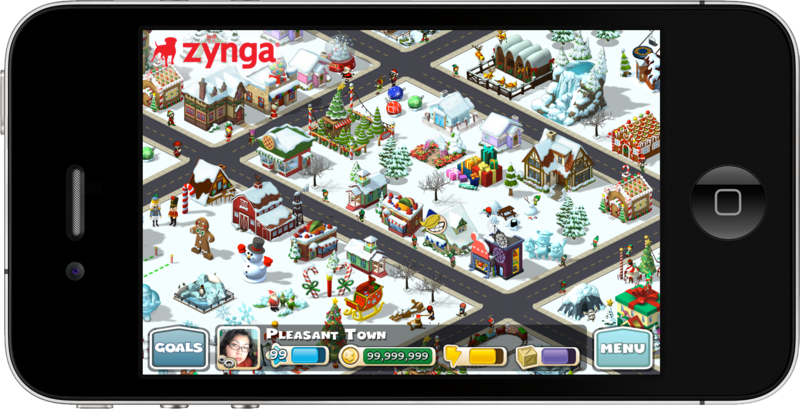 CityVille Holidaytown is part of the growing CityVille brand and is Zynga Mobile’s first Christmas-themed App that gets even the Scrooges in the mood to give, share and connect with their friends during the busy holiday season – anytime and anywhere they want to play. Don’t be a Grinch and download CityVille Holidaytown and help those elves get back to work! « Lions, and Tigers, and Polka Dot Baboons – OH MY!